Handmade artisan soap for Athena of Diva on a Dime – a custom set of 40 soaps for her sister's baby shower made with a palm-free vegan blend of premium butters and oils. 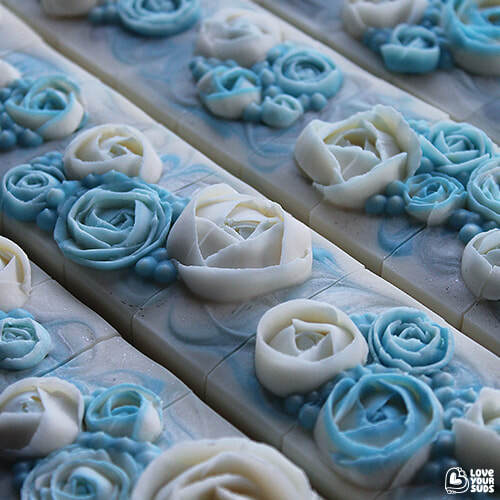 Featuring hand-piped soap roses along the tops and swirls of blues and silver within a base of white. 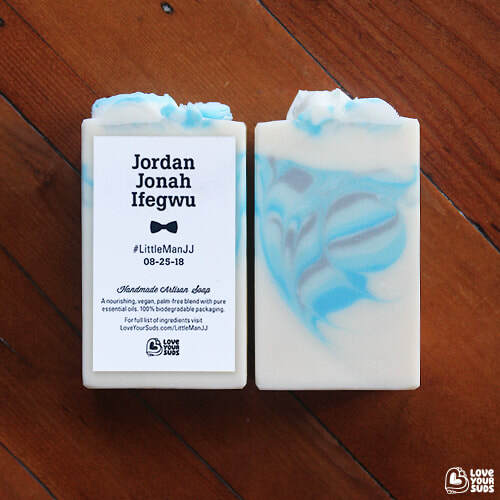 The scent profile for these beauties is reminiscent of relaxing spa days, with pure Eucalyptus, Cedarwood and Lavender essential oils. Finished with custom labels – designed in-house. Individually wrapped with 100% biodegradable shrink film. INGREDIENTS: Olea Europaea (Olive) Oil*, Cocos Nucifera (Coconut) Oil*, Butyrospermum Parkii (Shea Butter) Fruit**, Oryza Sativa (Rice) Bran Oil*, Canola Oil, Vitis Vinifera (Grape) Seed Oil*, Ricinus Communis (Castor) Seed Oil, Glycine Soja (Soybean) Oil, Purified Water, Lye (until saponification is complete), Kaolin Clay, Eucalyptus Radiata Leaf Oil, Cedrus Atlantica (Cedarwood) Bark Oil, Lavandula Angustifolia (Lavender) Oil, Titanium Dioxide and Mica.